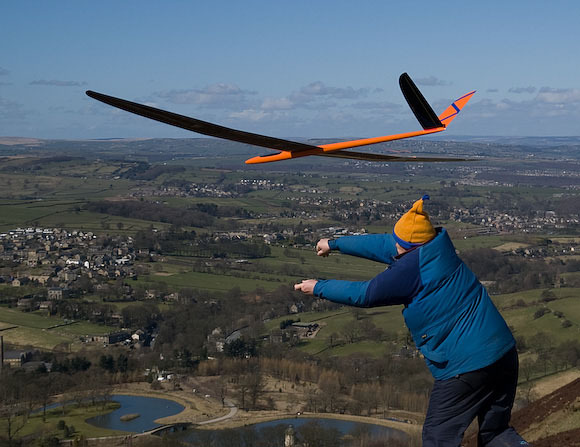 Slope sailplanes are a form of R/C glider that were designed for the slope or edge of a hill. I used to say that slope sailplanes needed to be medium to large in size, but with the advent of new radios and small, powerful servos, you can build a slope plane that's teensy. Most sailplanes or gliders tend to be made as light as possible, but slope soarers don't worry so much about the overall weight, but concentrate on precision and speed. And some are just built for combat on the slope and you can read about those planes here. Some slope planes tend to look like fighter planes and others can have long, thin, razor-sharp wings. However, I have flown some of my older, retired engine-powered planes on a slope too (minus the engine as you don't need it there). 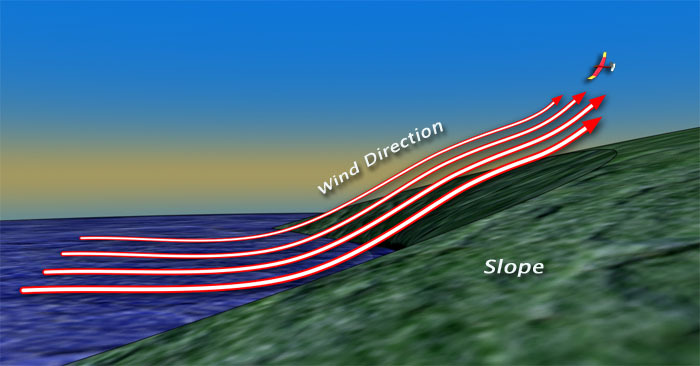 Most good flying slopes are hills or cliffs where the wind strikes the surface of a slope and rises as it is forced upwards due to the shape of the hill. The wind should blow directly against the face of the slope for maximum lift. However, if the prevailing wind doesn't strike the hill nearly 'straight on' or mostly perpendicular, the wind might end up blowing around the face of the hill instead. This will result in lots of wind blowing in your face, but no lift available for flying. Another thing that can affect the lift on a slope is whether there is a mountain or other hill within a half of a mile or so in front of the slope. Instead of the air lifting as it reaches the slope, it has a tendency to rise and fall often containing severe turbulence and unpredictability. It can make it impossible to control your plane or have any fun while flying on this kind of slope. Another thing to note is the top of the slope: on top, just back from the edge of the hill, the lift sometimes stops abruptly or spin towards the ground causing turbulence and other "rotors" that can cause the plane to pitch wildly as it nears the ground or there sometimes is no lift at all. If you're shopping around for a slope that no one flies, it is better if you find a slope with a smoother, more rounded top. Hopefully not covered by rocks either as the rocks have this ability to 'jump' in the way of a landing plane! Additionally, please don't try to fly near power lines or too close to someone's house. Both of these can be dangerous if something bad happens while flying. 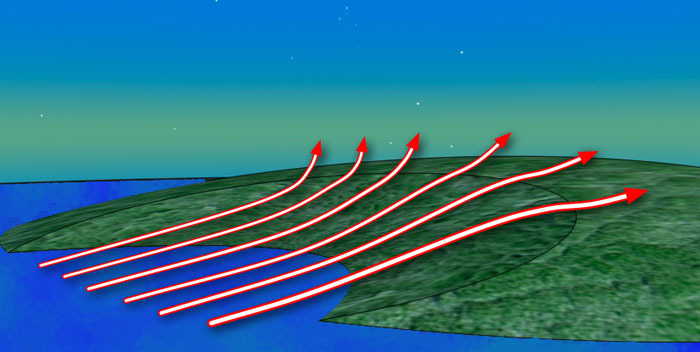 Here's a diagram of a nicely shaped hill where the wind moves straight in from the ocean or another un-obstructed surface and moves up the hill to generate lift for flying. On strong wind or strong lift days, it is not advisable to fly a lightweight trainer or a handlaunch on the slope as it can be very difficult to land a plane and, in some cases, the plane can be wrecked even by experienced pilots due to the turbulence that can occur in such conditions, especially on the top or back edge of a slope, where wind there can be known as the the 'rotor'. A perfect slope can be sometimes where the hill is in the shape of a bowl. That shape concentrates the wind to maximize upwards lift and often allows uniform lift all the way along the entire slope. The wind has no other direction to move except upwards. I have found this type of slope to be ideal. Just remember that lots of wind doesn't mean lots of lift. I've flown on slopes that were bowl-shaped in only 3-4 mph wind speed where the lift was simply tremendous. Also, there is a type of slope soaring that has become very popular these days called 'Combat' slope flying. The goal of this kind of flying is to essentially knock others out-of-the-air. You get 'points' for hits, but the goal is to knock 'em down as many times as you can in an afternoon. There are companies that are now producing sailplanes specifically for this purpose as well. Click here to read all about Combat planes. Horizon Hobby "Night Radian" - 78" span, motor glider with night lights! Combat planes are over here.